Brook Negussie on the University of Washington campus. Photos courtesy Brook Negussie. Speaking to the crowd of youth and adult advocates at the Summit, Negussie credited the Major Taylor Project for giving him the skills and motivation necessary to tackle any challenge. 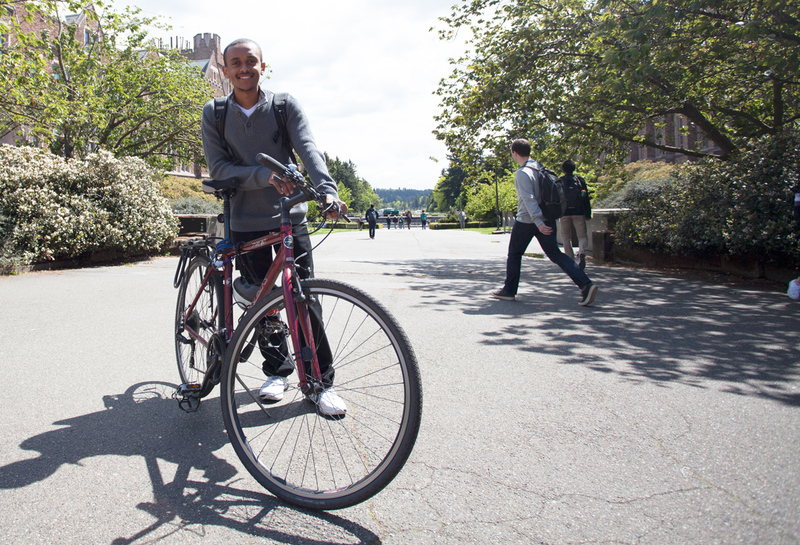 I sat down with Negussie at a coffee shop near the UW campus to learn more about his experience immigrating to the U.S., the role bikes have played in his life, Major Taylor’s impact and more. 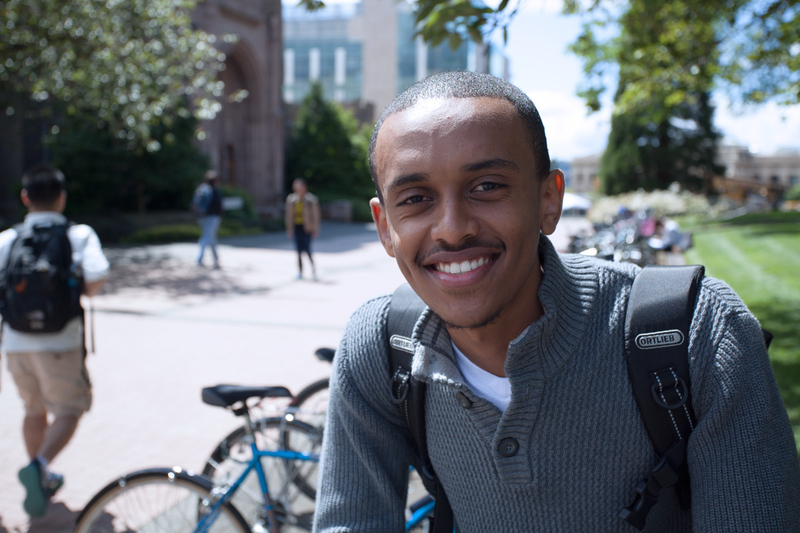 Did you learn how to ride a bike back in Ethiopia? Yeah. We lived in the capital Addis Ababa. It’s a really nice place. It’s very urbanized. I learned to ride when I was seven or so. Over there everything is enclosed in. We had a big house with a yard. That’s where we rode our bikes. We didn’t go outside [of the yard] much, like we do here. I would go up this big hill we had, then back down, over and over. It was a really fun experience. I don’t know what happened to that bike. When did you move to the U.S.? I moved to the U.S. when I was nine years old. That was in 2005. Why’d your parents decide to move here? I live with my mom now and my sister. We moved here to get a better education. My mom was an accountant over there at a really nice place. My dad also went to college and all that. But they knew we would have a better opportunity for our future here so they came here. Now my mom works at a minimum wage job just so we could have a really good future. That touches me and motivates me to become the best I can be, so I push myself every single day. What was it like as a nine year old moving to a new country halfway around the world? It was crazy. We technically got to come because we won this diversity visa called a DV. You apply to the government and if you get it you pay a lot of money and go through a two year process. Then you get to come here. When I first heard we won the lottery I was so mad. I was like, “I don’t want to learn a new language, I don’t want to move.” But I couldn’t really do anything. It was definitely for the better. I didn’t know what my future was going to be like over there. I remember at the Youth Bike Summit you were talking about riding around your neighborhood again when you moved to the U.S.
Yeah, I did. We lived in this house on a dead end. I used to ride there like I did in Ethiopia. I would go up and down a big hill near us. But then I broke my arm. It’s a funny story. I used to keep my bike outside. After I broke my arm, I went to the hospital and got a cast. Then a week or two later I had to go in to get it adjusted. I got back and the bike wasn’t there. I thought my mom had sold it or something. I couldn’t figure it out. She still claims no, but I dunno. I think someone stole it. It was just out in the open. After that, I didn’t get to ride a bike until I was in the Major Taylor program. How did you get involved with Major Taylor? They had a bike club at my high school. My friend wanted to join and I wanted to spend more time with him so I was like, “fine, I’ll join. I like bikes. They’re pretty cool.” He actually quit after a while, but I liked it so I continued and it was the best thing ever. [The program has] a lot of really nice bikes. They would come and help us get ready and teach us about bikes. We would go on weekly rides. It starts out really small, like four miles. I didn’t even think I could do that. There was a beach near our school, on the lake. We went there and I was like, “oh, I can actually bike this far.” Then it was eight miles and I really didn’t think I could do it. That was our third ride or so. They told us we were going to go around the SeaTac airport and I live near there in SeaTac. The ride was going to be eight miles. I really did not think I could do that. I’d never ridden that far. I’d only ever commuted in a car or on the school bus before. Just thinking about going to where I live on a bike was a totally new concept for me. But the [ride leaders] motivated me. They were like, “come on, we’ll have your back, it’s ok.” I just listened to them. When I was close to the halfway point there was this really big hill. I was so tired and thought I can’t do this anymore. One of the volunteers said, “come on you just have to pedal. Focus on one pedal at a time.” I was thinking about the whole thing like, eight miles, eight miles, eight miles, I can’t do it. But they said just do one pedal at a time and see where that takes you. I did that and eventually got up that hill and made it to the halfway point of the ride and realized, oh my gosh I can actually do this. That was the brink. I thought, what am I holding myself back from? It’s all in my head. That’s how I approach life now. I run a lot. I bike a lot. I lift weights. That has really helped me succeed with the things I thought I couldn’t achieve at all. I’m trying to do computer engineering and at University of Washington that’s one of the most competitive majors. I’m going to work really hard and I’m just going to do it. What are some of your favorite rides you did with the club? Did you do Seattle to Portland (STP) ride or try out cyclocross or any of that? Oh yeah. I did all of that. Cross was really fun. After we finished it would be so cold and all of that and we would go to this really nice pizza place. We just got to talk and it was like a family kind of thing. That was my favorite moment. Are you still riding now that you’re out of the club? Yes. When I did Major Taylor I got to do the Earn-a-Bike program. You get a bike and break it up. They say we’ll teach you how to fix it and if you fix it we’ll give it to you. I did it and still have that bike today. I ride around UW since it’s a big campus and I don’t like walking. I do my daily exercise in the morning. I wake up at 6 and go to the gym or run or bike. I have a daily schedule. I already get my exercise so I like to bike around cause it’s so much easier and faster. I’m planning to do the STP in one day this year. I’m also planning to do the Seattle Marathon this year too. I’ve been working on it and it’s been really hard. I’ve been a runner since 8th grade and my joints are getting worn out. But I’m working on it, it’s just something I’ve got to do. After that I’m going to try to do a triathlon. Major Taylor has taught me there are no limits. The limits are just in our head. That’s how I live my life and it’s working out. How does a program like Major Taylor help the kids involved? I know when I talked to Ed about it, he said it’s not just about riding bikes or not just about learning to fix bikes. It just gives you a way to not think about school for a second or anything like that. That’s how I got into. Just hanging out with my friends. Once you get in you see that there’s a lot of big branches that bikes connect you to. Connecting to really important people that you would never otherwise meet. Do you feel like you were really goal oriented like this before Major Taylor or did it have an impact on you in that way? I was this way, but Major Taylor definitely amped up my motivation. Major Taylor works very specifically with kids in under-served schools and from predominantly immigrant and lower income communities. Did you ever talk about that while you were in the program? Was there ever conversation about equity or whatever else? They had this one retreat that I got to go to, and I think they do it every year, where we actually talked about the poverty cycle and how it perpetuated and all that. I already sort of knew that, but we got to learn more about it. But with biking you don’t even have to talk about that stuff. You just hang out and creates community. Do you have any other cycling goals on the horizon besides doing STP in one day? This entry was posted in Advocacy, Interviews and tagged bike equity, brook negussie, cascade bike club, cycling in seattle, ed ewing, major taylor project, youth bike programs, youth bike summit. Bookmark the permalink.